The Sherlocks are a British indie-alternative outfit from Sheffield. The band consists of two sets of brothers: Kiaran (lead vocals, rhythm guitar) and Brandon Crook (drums) along with Josh (lead guitar) and Andy Davidson (bass). 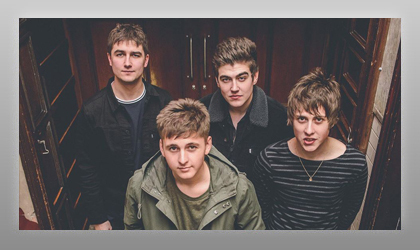 Formed by their shared love of music including The Stone Roses and Sheffield's own Arctic Monkeys, The Sherlocks hit the local clubs playing covers while mixing in their original songs during their sets. They booked a show in the smaller room at the O2 Academy—which they sold out—and that night launched a new generation of Sheffield rock. The Sherlocks continued to work on their craft, releasing successful singles and earning support from the likes of BBC Radio 1's Huw Stephens, Steve Lamacq and Annie Mac. In the summer of 2017, they released their debut album Live For The Moment, featuring the title track of the same name.